1,3,4-oxidiazole thiones as inflammation inhibitors. Synthesis of "1-2'-(5'-alkyl-1',3,4'-thiadiazolyl)-2-methyl-4-(2"-phenyl-indole-3"- yl)-methylene-imidazole-5-ones" as CVS, CNS and anti-inflammatory agents. Study of abietic acid-sorbitol derivatives as microencapsulating materials. Solubilization of uvinul d-50 and uvinul n-35 by nonionic surfactants. Sodium fluoride tablets using carboxy methyl cellulose. Differential pulse polarographic determination of diazepam in pharmaceutical formulations. Chemical constitution of drumstick polysaccharide. Formulation and evaluation of despersible tablets of poorly soluble drugs. Synthesis of new 1, 3, 4-oxadiazolo [3, 2-a]-s-triazine-5, 7-dithiones and the - dithionone analogues as potential antifungal agents. Potential anticancer activity of saraca asoca extracts towards transplantable tumours in mice. Differential pulse polarographic determination of dantrolene. 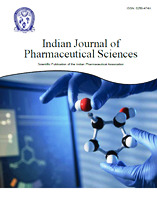 Spectrophotometric determination of diclofenac sodium in pharmaceutical dosage forms. Copyright © 2019 ijpsonline.com. All Rights Reserved.